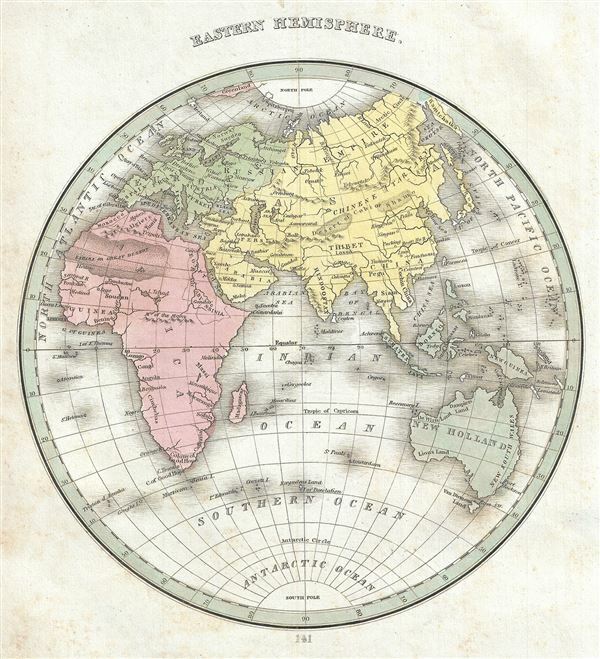 This is a fine 1835 map of the eastern hemisphere by the important American mapmaker T. G. Bradford. It covers the entirety of Asia, Europe and Africa as well as Australia and the East Indies and much of the Pacific. Important cities, rivers, islands and mountains, along with other topographical features are noted. Although 'New Holland' officially changed its name to Australia in 1824, it is here referred to by its older Dutch name, a term that would fall out of favor shortly after this map was printed. The interior however, is entirely unexplored. In Africa, the source of the White Nile is set in the speculative Mountains of the Moon. The interiors of Africa and Asia here follow archaic geographical conventions - giving evidence to the general lack of knowledge about these regions in the early 19th century. The Great Wall of China is noted, but not identified. The map was published as plate no. 141 in Thomas G. Bradford's 1835 Comprehensive Atlas Geographical, Historical and Commercial. Bradford's atlas, published in 1835 was an important work on many levels. First, it was one of the first American atlases to follow an encyclopedic format, offering readers extensive geographical and statistical tables to supplement the maps themselves. Second, it was published in Boston and influenced the city's rise as a publishing center later in the 19th century (at the time most publishing in the United States was restricted to New York and Philadelphia). Third, this atlas was the first to contain a separate and specific map showing the Republic of Texas. Fourth and finally, Bradford's atlas in some instances broke the Euro-centric mold regarding atlas production. Among other things, Bradford focused his atlas on the Americas and abandoned the classical decoration common in European atlases in favor of a more informational and inherently American approach.